Washington and Lee University (W&L) has engaged in sustainability initiatives for many years, including recycling, composting, installing compact fluorescent lighting, turning off unneeded lights, increasing walking and biking, printing double-sided copies and growing vegetables for its Campus Kitchen Project. These efforts, along with the president’s commitment to the Talloires Declaration and the American College and University Presidents Climate Commitment (ACUPCC), will help W&L achieve the ultimate goal of climate neutrality. The University’s carbon footprint is calculated every other year to track progress towards reducing and eliminating carbon emissions. The amount of metric tons of carbon dioxide equivalences was reduced by 13% or 3,458 MtCO2e between 2007 and 2009. As part of their ongoing efforts in this commitment, the university embarked on an aggressive plan to further optimize their already impressive sustainability efforts by hiring Westridge Energy, a client of Activelogix and one of their most successful regional firms, to design and implement more extensive control and monitoring systems on the campus. Enhanced visualization was key to enabling better performance, improved stakeholder involvement and community communications. Out of the university’s 100+ buildings and 2.1 million Sq FT, this project focused specifically on a subset of 24 campus buildings, and 1.4 million square feet of facilities, which had no pre-existing sub-metering. Along with monitoring standard equipment, W&L had also utilized alternative energy sources in the form of Solar PV and Solar Thermal, both of which also needed to be monitored. The overall challenge was to reduce the campus’ carbon footprint 20% by 2020, and lower the BTU/Sq FT by 25% within 4 years. “To date we have met both goals of carbon and BTU reduction”. 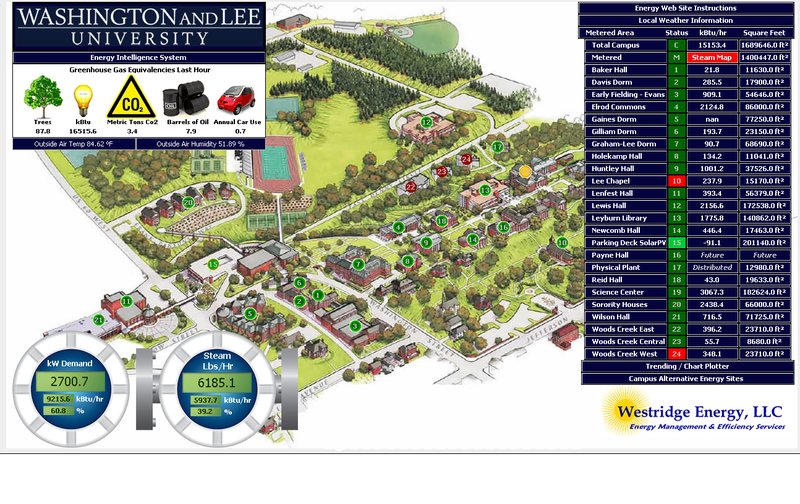 Westridge Energy was hired by W&L to provide a comprehensive energy monitoring solution for their University. Working closely with the W&L Director of Energy Initiatives, Scott Beebe, a master plan was developed to add submetering and substantially improve the visualization of campus consumption for all energy sources. Initially, 1.6 million sq. ft. of space was served by one electric meter with no sub-metering of electricity or domestic water. The project scope included the installation of sub-metering in 12 buildings amounting to nearly 400,000 square feet of space (394,931 ft2). Each building now has all energy monitored, be it electric, hot water, steam or chilled water metered and converted to BTU. PeriscopeTM was the chosen software solution for the pop-up “user-defined” building dashboard component of W&L’s EIS. Clicking the building number in the EIS campus legend now brings up a Periscope dashboard for a particular building. Various points and trends relative to the building are displayed in the dashboard in various colorful Periscope viewlets. The University also provided the campus energy director Scott Beebe with extensive training on Periscope so that he could perform custom energy analytics and mine the wealth of data collected in the EIS, using the Periscope tool set. Scott also uses Periscope dashboards to track energy reduction “competitions” that he has fostered in the campus community. The comprehensive metering and energy solution provided by Westridge Energy included their EIS (Energy Intelligence System), integrated with Periscope, provided by Activelogix. The EIS included a live map that allowed real-time total campus, building, and process performance tracking. This map displays each building with a dot that changes color from green (normal) to yellow (building is running 10% above BTU threshold) to red (20% above threshold). This approach was fundamental to getting stakeholder participation to proactively lower energy demand where possible. According to Scott Beebe, W&L Director of Energy Initiatives, “To date we have met both goals of carbon and BTU reduction”, and as Scott re-iterated, “You can’t manage what you can’t measure”. Washington & Lee has seen great progress in campus energy reduction and sustainability initiatives as a result of using the Westridge Energy EIS with Periscope. Campus energy awareness peaked quickly and has remained high since EIS implementation almost 2 years ago. 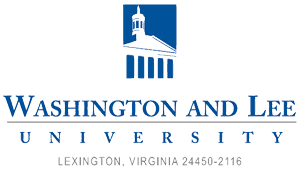 In addition to meeting or surpassing their initial goals, Washington & Lee has also greatly enhanced their focus on “Energy and Sustainability Awareness” across the campus and the community. Washington & Lee has met both of their goals of carbon and BTU reduction. Washington & Lee is located in the historic city of Lexington (population 7,000) in the Great Valley of Virginia about three hours southwest of Washington, D.C. W&L’s 35 principal buildings include the picturesque Washington College group forming the Colonnade facing Lee Chapel, where Robert E. Lee is buried. 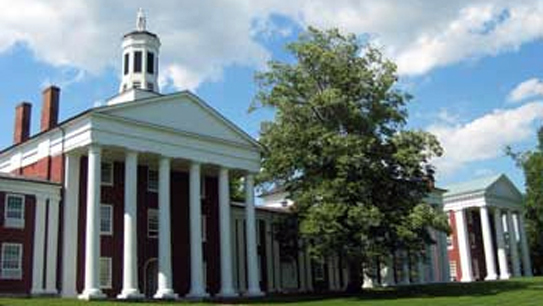 The Colonnade and Lee Chapel are National Historic Landmarks. New or recently renovated buildings include the John W. Elrod University Commons, the journalism department’s Reid Hall, the Doremus fitness center and Wilson Hall, the fine arts and music center. Westridge Energy, LLC is a Niagara AX Framework and Honeywell system integrator providing the best of class energy services to commercial, industrial and governmental clients that are both open protocol and non proprietary. We are also experts at wireless monitoring and control delivering systems with ROI’s of 2 years and less. Our focus is helping customers reduce energy use , demand and cost integrating cutting edge technologies to a web based front end. Customers also substantially reduce their carbon footprint and improve their bottom line. See www.westridgeenergy.com.